Whether you’re protecting your furniture or your hands, hot pads are essential kitchen equipment. A quilted mat, made with an insulating type of interfacing, resists heat even more. You can choose fabrics to brighten the kitchen and tie all the other colored elements together. A fat quarter of fabric will create at least two 8-inch hot pads, making it an economical project as well. Cut two 8-inch squares of each of the materials: fabric, insulating batting and cotton batting. Place one piece of the cover fabric on your work surface, right side down. Layer a square of cotton batting on top of the fabric. Position a square of insulating batting on top, metallic side down. Put the second square of insulating batting next, metallic side up. Lay the second square of cotton batting on the pile next. Add the second square of cover fabric on top, right side up. Stitch around all four sides of the squares, using a 1/2-inch seam allowance. Backstitch at the beginning and end of the stitch line to secure the threads. Trim the seam allowance to 1/4 inch. Insert the square into the bias tape, beginning at a corner and pushing the edge of the fabric sandwich against the inside of the fold. Pin the tape around all four sides, leaving a 4-inch tail at the corner, if you would like to hang your hot pad when it is not in use. Fold the tail in half and put the ends under the bias tape already pinned to the pad. Stitch around the pad again, using a zigzag stitch and sewing as close to the open edge of the bias tape as possible. Mark 1-inch intervals along one edge of the hot pad with the chalk pencil. Repeat on the opposite edge. Use the chalk pencil to connect the marks for quilting lines. 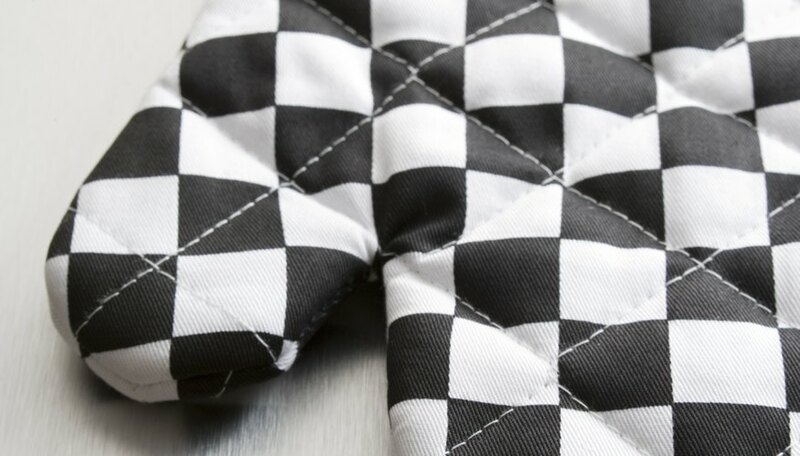 Stitch along the lines to create the quilting on your hot pad. You also can create a quilt block, using traditional patterns or your own design, for use in place of the cover fabric. You can make two matching blocks for each side, or you can use a complementary solid or print fabric as the back of the hot pad. Your hot pads can be made in any size that works for your kitchen needs. A 4-inch mini pad is a cheerful accompaniment to a morning cup or coffee or tea, while a 10- or 12-inch mat will accommodate your family sized stew pot. Be sure that the wrong sides of the insulating batting -- the nonmetallic sides -- face each other when you stack the fabrics so that there is heat-resistance from both sides of the pad. Your new hot pad is heat-resistant, but it will not block all heat. Use caution when handling hot items or when placing them on furniture or countertops.